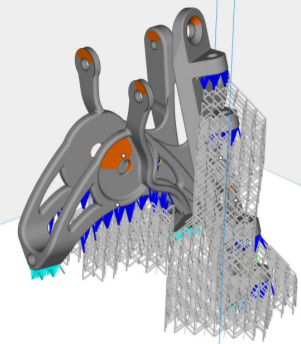 The open diamond structure of the supports generated by Materialise e-Stage doesnt just make it possible to recover larger amounts of expensive metal powder, it also significantly reduces the risks related to HSE. 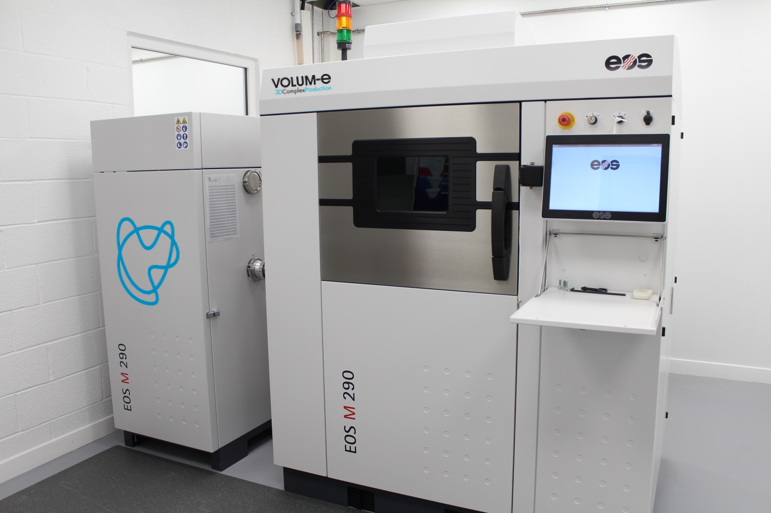 The company volum-e is specialized in the Additive Manufacturing of plastic and metal parts, both prototypes and end-use parts. They serve a wide variety of industries with one of the largest machine parks in France. To increase the efficiency of their highly complex metal production, and especially to increase the conditions of the machine operators, they decided to try out a brand-new product on the market: Materialise e-Stage for Metal. 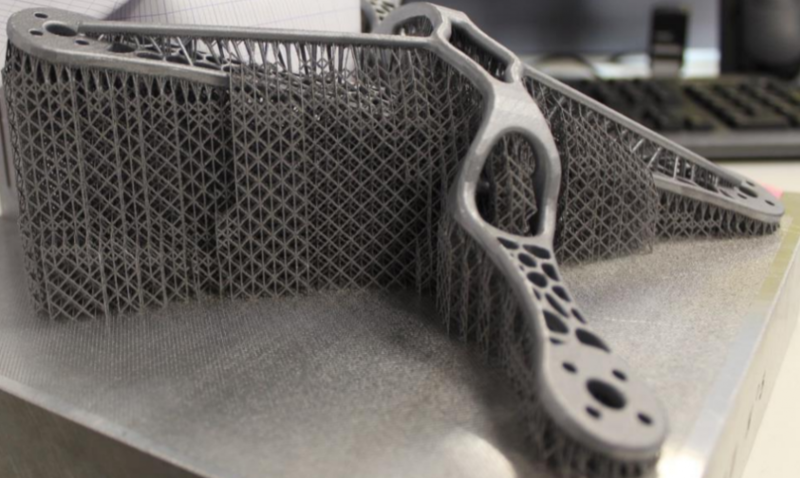 Crafting metal support structures is a time-consuming job that requires a lot of Additive Manufacturing know-how. Where the supports are placed highly influences the success of a build and how easy it is to remove the supports. Although you want to limit the amount of supports in order to keep costs and print times low, they are still essential in some places to counter stresses and avoid warping. Materialise e-Stage is a software program that calculates exactly where support is needed and automatically generates the optimal metal support structure for your part. 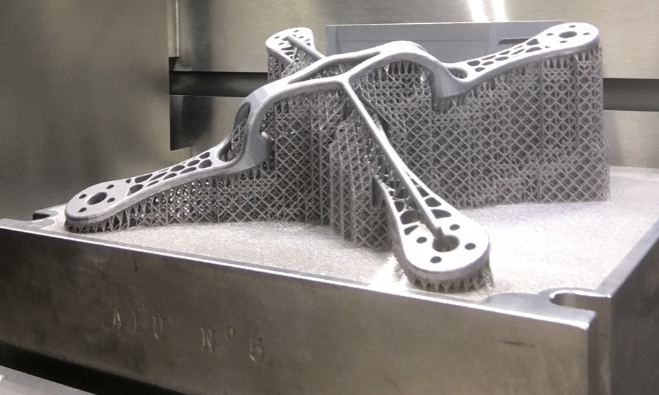 By printing their titanium and aluminum parts with Materialise e-Stage, volum-e managed to reduce their support generation time by 80%. Since the supports are built on an open grid structure and consist of very thin connections, the time spent on support removal went down by a stunning 50%. “The support structures generated by Materialise e-Stage led to the same high quality standards as the previous process. The difference is the huge increase in speed for support generation and removal,” says Clément Barret, AM manager of volum-e. Automation, speed, quality and cost reduction are all important drivers for improving the 3D printing process, but business isn’t all about money. It’s also about people. And everyone involved in Metal AM knows that HSE (Health, Safety and Environment) is a big issue for machine operators since the powder trapped in regular support structures is released during support removal and can enter the lungs of the operator. The open diamond structure of the supports generated by Materialise e-Stage doesn’t just make it possible to recover larger amounts of expensive metal powder, it also significantly reduces the risks related to HSE. No trapped powder in the support structure means no loose powder in the working area. 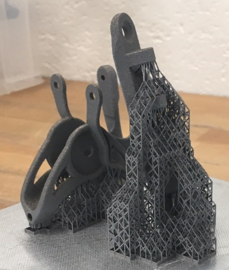 As one of our valued beta-testers, volum-e was one of the first to print parts using Materialise e-Stage, and the drone on the image above was used for a try out. For this specific part, 1.5 man hours could be saved on support generation. The dimensions of the part are 250 x 250 x 80 mm. volum-e printed it on an EOS M290 machine, after slicing the heavy data using the EOS Build Processor. The post-processing steps for a part like this drone are usually quite time-consuming. But for this particular part, volum-e experienced that the support removal process was two hours shorter.